Statesman, military leader and head of the national liberation struggle of the Kazakh people against the Russian Empire, 1837-1847, the last khan of the Kazakh Khanate. Kenesary Kassymov (1802 near Mount Burabai, Kokshetau - 1847 Chukar Sengir hill near the river Karasu), statesman, military leader and head of the national liberation struggle of the Kazakh people against the Russian Empire, 1837-1847, the last khan of the Kazakh Khanate (1841-1847). Chingizid, the grandson of Khan Abylai. Father Kenesary-Kasim Sultan, Kasim, or torus, was born the daughter of zhongarskogo huntaydzhi Galdan Tserena. Kasim, being noble and rich Genghisides (torus), had several wives and numerous offspring. 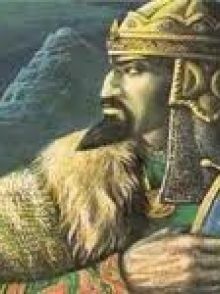 His senior wife Aykumis was the mother of 6 children Kasim - Sarzhan, Esengeldi, Cats, Agatay, Bapa and Kenesary bop Kenesary younger sister, was an active participant in the uprising K. Batyr Nauryzbai, the younger brother Kenesary born to the 2nd wife of Kasim, was also active part in the uprising.